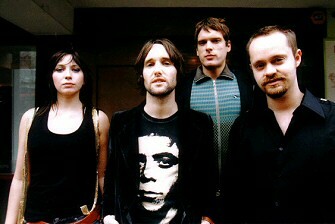 Ash are one of those Irish bands that I have admired for sometime. Starting out back in 1992 as teenagers the band has really come along way. Being an Ash fan and living in the USA make things hard as their music has never really found a place over here. To me this is a shame and a band like Ash have really never got the love that they deserve here in the USA. They are so talented and if you go back and listen to 'Free All Angels' it has hit song after hit song on it, and at its time it should have been getting the type of love and fanfare that a band like Coldplay was receiving. Speaking of Coldplay, Chris Martin has always been a huge fan of Tim Wheeler and Ash and has often referenced Ash as one of his favourite bands and has also showed his love for Wheeler as a singer/songwriter. Ash celebrate a career that has encompassed two #1 albums and eighteen Top 40 hits with the release of ‘The Best of Ash’ on October 17th. Some of my favourite songs would be 'Shining Light', 'Walking Barefoot', and 'Sometimes' that all could compete with all the major indie/Brit bands over the past 20 years. The album features a brand new recording of ‘Jack Names The Planets’ which originally featured on their debut EP ‘Trailer’. Also a special CD / DVD format of the album will feature the first ever release of the previously unseen tour documentary ‘Teenage Wildlife’. Entirely self-funded, it depicts the band’s rise from local school heroes to the all-conquering band that topped the charts with their debut album ‘1977’. Formed in Downpatrick, Northern Ireland by Wheeler, Mark Hamilton (bass) and Rick McMurray (drums), Ash released their first studio album ‘1977’ and were then joined by Charlotte Hatherley (guitar) for a further 3 studio albums ‘Nu-Clear Sounds’, ‘Free All Angels’ and ‘Meltdown’. Charlotte left the band in 2006 and the band went on to record and release ‘Twilight of the Innocents’ before launching the innovative A-Z series which saw the band release a single every fortnight for a year. Bloc Party’s Russell Lissack has joined the band on stage since 2010.